We are one of the leading manufacturers and suppliers of a wide range of Horizontal Band Sealer. The offered product is a new model automatic plastic film sealing machine which is available in the market at industry leading prices. Also, the offered machines can perform multiple tasks like color printing, sealing and continuous transmission of products. These can perform instant sealing with clean and bright pattern in various colors. 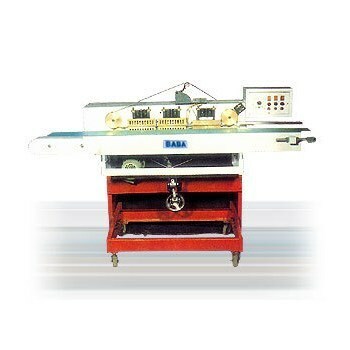 BABA PACKAGING manufacturer and exporter of Liquid Packaging System Weighmetric (Loadcell based) Computerised Automatic Packaging SystemHorizontal Pillow Wrapping Machine, Shrink Wrap Systems, Automatic Form - Fill & Seal MachinesAuger Base Form Fill & Seal Machine, Collar Type FFS Machine for Granules Powder & Snacks, Vertical/ Horizontal Band Hard Boiled Sugar Candy, Single Cup FFS Machines for Packaging Granules Itemsand Liquid Dosing Machine with Conveyor, BABA PACKAGING was established in the year 1998 by a group of highly experienced and qualified engineers to cater the needs of flexible packing machines of the Indian market & that of the neighbouring countries.Liquid Packaging Systems - For liquid packaging of Mineral Water, Milk, Butter Milk, Soft drink, Lassi and Country Liquor.